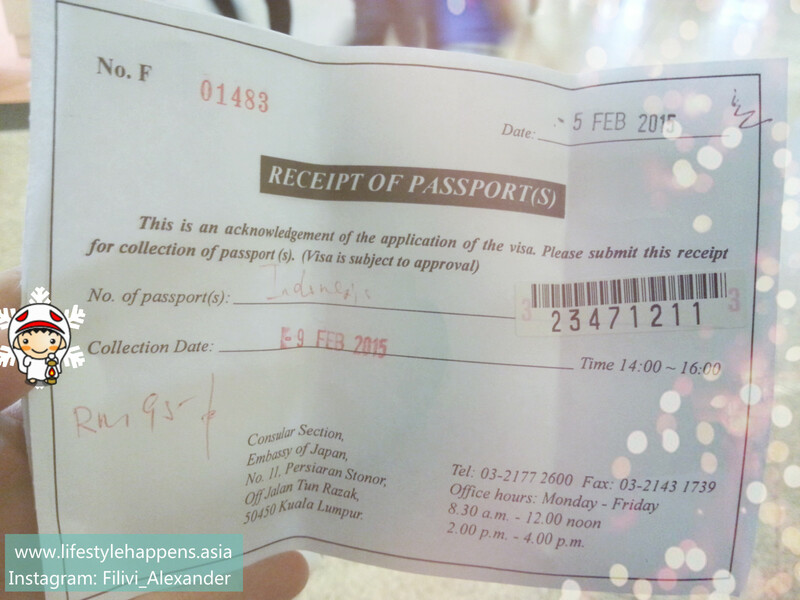 Original passport (working visa in Malaysia must be valid for not less than 6 months upon Japan visa application). The embassy did called me after I submitted my visa because my working visa will be expired in 4 months time. Luckily I have anticipated this will be the case therefore on my company letter I have specifically requested to our HR to mentioned that my working visa is renewed yearly and voila, the embassy accepted it. *Please fill up each row for each day you are in Japan. *There is no minimum amount required on the bank statement. They just want to see that you have regular income being transferred to the bank account. If you are student, you may use your parent/guarantor bank account information. Please make sure all documents are exactly as describe (ex: photo size and color correct) and filled properly when you submitted your document to the embassy. Submission and collection can be represented. If you submit the application for your family member, you must have document that show that you are a family member. For example, married certificate. Once they accept all your application documents, you’ll receive a receipt as below with the collection date. If you receive no call from the embassy during the processing period then all should be fine and you may collect your passport with Japan visa in it at the collection date. Come on the afternoon time 2pm- 4pm. Got it 2 days before my departure date. Yes TWO days before departure date. There were so many obstacles that delaying me to submit my application earlier. I have to admit I was really nervous about it and make me kindda stress. Anyway thanks God all is settled. All requirement are the same. I am Pn. Lia from Malaysia.My hubby is Bangladeshi citizen, want to visit Japan travel from Malaysia for sightseeing so what the requirement needs,pls. I want to visit Japan or looking for Hotel management any kind of job ,so what the requirements ? can you sent me what need the requirements ? Hi Filivi, Can I ask regarding the guarantor and inviter at the Visa form? Does it compulsory? Also can you send me a sample of Company Letter to my email below? You can skip the guarantor part and as for the company letter, you may ask your HR to provide the letter. Informed them the letter purpose is to informed Japan embassy that you (your full detail include passport no, employee id, etc) are currently employed at the company and you have received permission to travel to Japan and that you will come back to Malaysia after the trip. i am Managing Director VIVA IT SERVICES SDN BHD Last 9 year,now i want to vist japan with my family,i want to know can i apply vist visa for japan for 7 days because my daughter have school holiday. Hi Filivi! Can you send me a sample of company’s letter? xinyelee2001@gmail.com Thanks. Hi Filivi….Im Shima from Malaysia.. Im still a student and soon to be graduate..so me and my friends plan to travel together and we choose japan..Do we need rm6K in bank account to travel there?? ?since we just a student..so our bank statement is like ermmm…hahaha..
For Japan Visa, they are not strict on the amount in your bank account. Thank you Filivi, I just received your email. maybe its a little silly to ask but for the form, can i print it out and write down or fill in by typing and then print out? 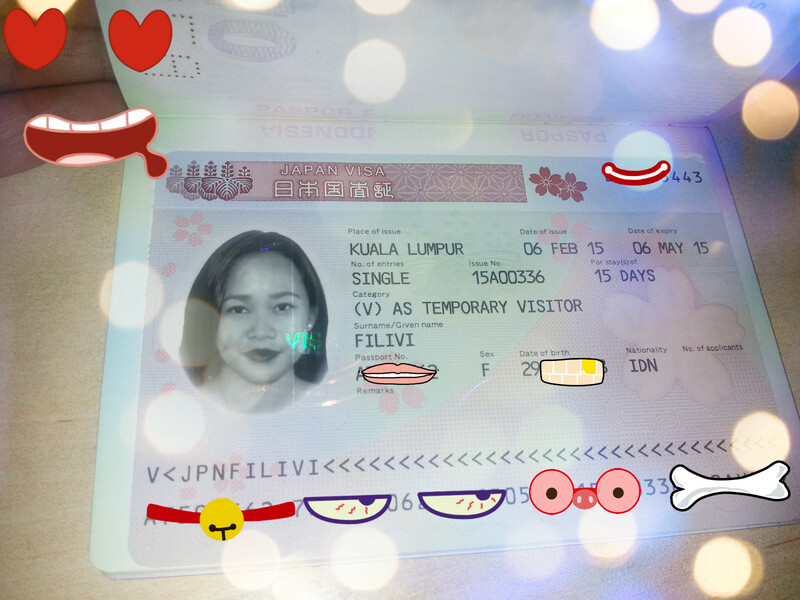 Hello Filivi, I am so glad that I got Japan visa on Tuesday, ready to have a trip in October. Thank you so much for your help. #bighug!!! thank you filivi, it will be a must to check out your blog for further trips in the future. Thank you alot for your information..
Could you please send me an example of the company letter. I am quite confused about this. Good to know I’m not the only Indonesian that needs to apply visa from Malaysia. Thanks a lot for your useful information. I just wanna ask if you didn’t attached other documents such as plane ticket and hotel booking, did you? And if you don’t mind please send me an example of company letter to my email elly_kusdiarti@yahoo.co.id. Hi, itinerary of Airplane ticket and as well as the booking of hotel required? Currently i am holding dependent pass and planning myself and my infant son to go Japan next month. However, the bank statement under my husband’s name, is it possible? Do I still need the letter from my husband company? Terima kasih ya mba atas bantuan dan sarannya. It best for you to write directly to ryo@kl.mofa.go.jp and state your condition clearly so that they can advice you on the necessary documents you need to submit on applying your visa. Unfortunately I’m not familiar with requirement for another country. I believe It best for you to write directly to ryo@kl.mofa.go.jp and state your condition clearly so that they can advice you on the necessary documents you need to submit on applying your visa. You need to submit latest 3 months bank statement. Most importantly they want to see that you have source of income on regular basis (example: salary will show regularly on monthly basis on your bank statement). The Japanese embassy in Malaysia does not have formal requirement that you have to have certain amount of money in your bank account. Unlike Korean embassy, it is a must for you to show that you have at least RM10k in your bank account for the lastest 3 consecutive months. Could you please send me an example of the company letter. My company kind of fussy about this. Thank you. Sorry for the late reply. I was travelling lately. Do you still need me to send you the company letter?